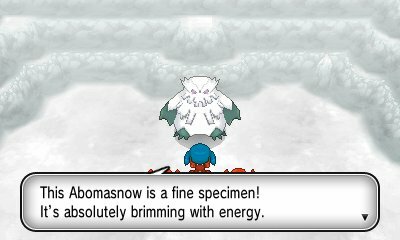 Like the previous Pokémon games, Pokémon X & Pokémon Y feature another antagonist team who try to thwart you in every way as you travel through the region of Kalos. This team, is Team Flare. This page will be updated with all encounters of Team Flare as the game is out. 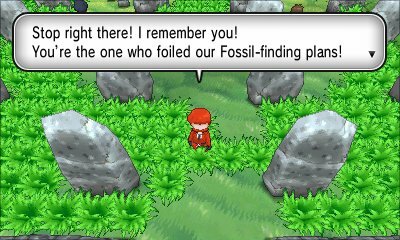 The first encounter with Team Flare is within the Glittering Cave off Route 9. When entering the deepest part of the cave, where the minecarts are, Team Flare are encountered. They have taken up residence in the cave in order to hunt for fossils. However, as they're battled, your rival will appear and help you defeat them.. The next encounter with Team Flare is within the Menhir Trail of Route 10. 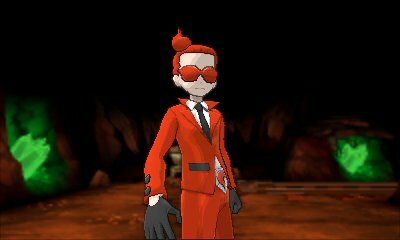 When approached, Team Flare will recognise you and decide to battle you in order to get revenge. They reveal that they are investigating the stones based on something that happened 3,000 years ago. When you get to Geosenge, you will find another Flare Grunt who exclaims that it's the town of the stones, before he runs off. Previously, it was made clear that these was a blackout affecting the northern and central areas of Lumiose City. As you reach Route 13, you discover that Team Flare have actually been in Route 13 and the Kalos Power Plant. Having to defeat a Grunt to get the pass, you can gain access to the Power Plant. Entering the Power Plant, you see that Team Flare have taken it hostage and are using the energy there to try and power an as of yet unnamed device. The admin and scientist Aliana challenge you. Once you've defeated them, they will leave. 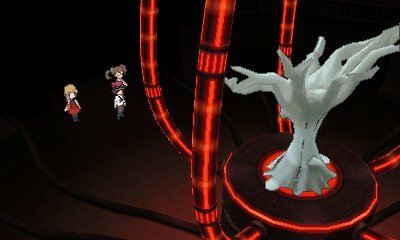 The next encounter with them is within the PokéBall Factory just off of Laverre City. When you arrive, Shauna and Trevor are insisting that they can get in while Serena and Tierno lag behind. However, Team Flare's member starts to chase them off, giving you access to the factory. Inside the factory, you have to make your way through, defeating grunts. 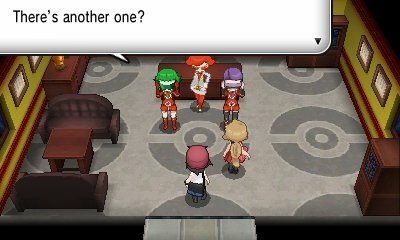 Get to the office and you'll find the Team Flare scientists Celosia and Bryony are attempting to convince the president of the company to join them so they can get all the PokéBalls necessary. When he declines, they threaten to destroy the factory. Defeat the admins and they shall leave saying their objective is complete and they have stolen enough PokéBalls. When you enter the Café, you will have to challenge two trainers and find the hidden access to Lysandre Labs, a sercret base behind the café. 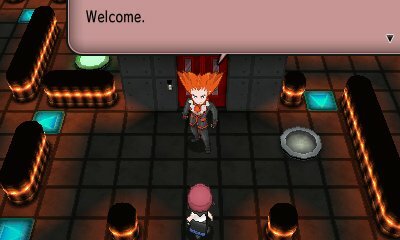 Upon entry, Lysandre welcomes you and explains his plan is to make sure humans don't ruin the world. He will challenge you. Defeat him and he'll realise that you are there to stop him, and asks you to stop. He says you have to defeat everyone to stop him. Fighting through the lab, you will get the elevator key by getting it off of one of the Team Flare scientists. Once you get the elevator key, you can gain access to the next floor where there is the mysterious man in a jail. Lysandre will claim that he is the king from 3,000 years ago and explain that he created the ultimate weapon that they are trying to activate. He will give you access to the next basement and give you a choice. You can either disable the weapon, where he'll let you continue and not ever activate it again, or for you to activate the weapon and be saved along with Team Flare. However, after being defeated in battle, the Team Flare scientist Xerosic will activate the weapon regardless of your wishes. 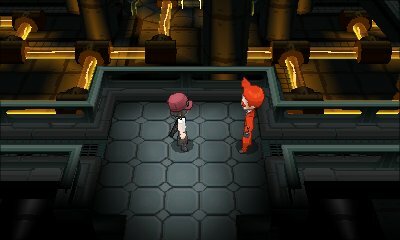 With the weapon starting to activate, you have to go to Team Flare Headquarters which happens to be in Geosenge Town where the weapon and rocks are. When you arrive, you will be joined by your rival and Shauna. Lysandre will apologise for Xerosic not abiding your wishes of not activating the weapon but then state that the world does need changing, and needs to be a world of beauty where things are shared, but where Pokémon don't exist. Defeat him and he'll give you a chance to find the legendary Pokémon that is being used to power the weapon, but saying it's too late. Rush to the lower floor, defeating Flare grunts and scientists and you'll find Xerneas or Yveltal as part of the machine. Once captured or defeated, Lysandre will appear and challenge you once more, wanting to take the Legendary Pokémon from you and try again. 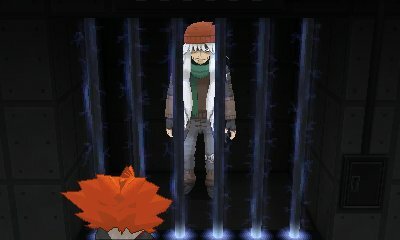 Once defeated again, Shauna and your rival try to convince Lysandre that the world is a good place and things are to be shared. However, Lysandre makes a declaration that he will grant you all eternal life and activates the weapon. However, the weapon has been reprogrammed and returns its fire in on itself, destroying it once and for all.